There have been no shortage of headlines to comb through during this long IndyCar offseason. From the announcement of Ed Jones joining Chip Ganassi Racing to Danica Patrick’s surprise Daytona 500/Indianapolis 500 double, to the latest in 2018 universal aero kit testing and brand new entries into the Verizon IndyCar Series, there has been a little something for everyone. Since our last Round-Up entry on December 8, a brand new entry has joined the IndyCar ranks in Carlin Racing, Keith Donegan won the 2017 Mazda Road to Indy Shootout and will get a $200,000 scholarship to compete in USF2000, and manufacturer testing has concluded for the year. Check out our recaps and the latest in IndyCar with the Open-Wheels Round-Up. On December 12 it was formally announced that Indy Lights, Formula 2, Formula 3 and Formula 4 team Carlin Racing would join the Verizon IndyCar Series and compete full-time in 2018. The outfit has hired drivers Max Chilton and Charlie Kimball to lead the two-car effort and Chevrolet will power the new team. Carlin is the third team this offseason to announce an expanded IndyCar program for 2018, after Juncos Racing announced they will appear in at least four races with Indy Lights champion Kyle Kaiser and Michael Shank Racing made formal their intentions to run in a minimum of six events with Jack Harvey as their pilot. Harding Racing is also expected to make their intentions of running full-time in 2018 known sometime in late January or early February. After hiring Brian Barnhart and Al Unser Jr. to senior roles, Gabby Chaves is in the best position to succeed in his career and is surely eager to get started at St. Petersburg. It continues a period of growth and strengthening for the series as new teams are added, and consequently, new business partners. The time is right for prospective owners to dip their toe in the IndyCar pool, and just maybe they will stick around and become full-time owners. This week’s testing at Sebring International Raceway in Florida brought to a close the 2017 testing of next year’s car. When the window re-opens on January 9, A.J. Foyt Racing’s Tony Kanaan will be among those most anxious to get back in the car. 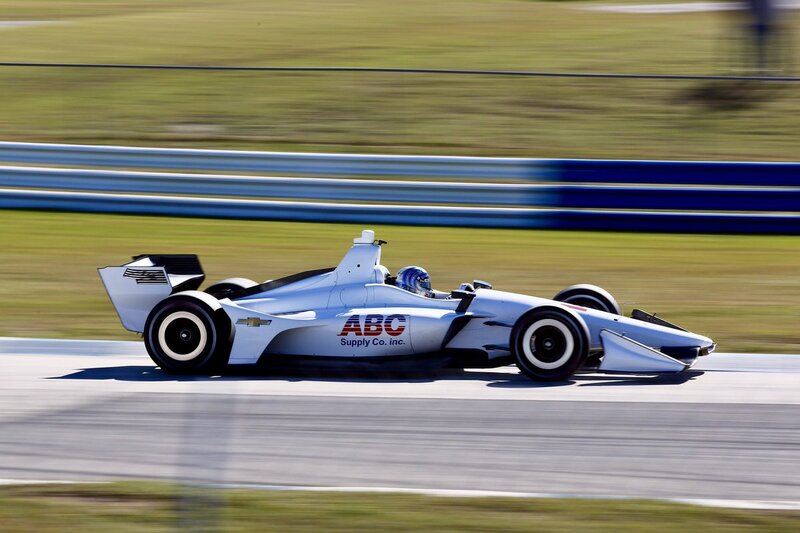 Tony Kanaan tests his A.J. Foyt Racing car at Sebring on December 14. “I’m telling you, it feels so good to drive this car,” Kanaan exclaimed to Racer’s Marshall Pruett on Wednesday. The reduced downforce on the 2018 universal aero kit has Kanaan enjoying the top-end speed and hard-braking he once knew earlier in a 20-year career. The Brazilian also added that the driver will have much more work to do in 2018 as a result of these performance adjustments. Despite being with a new team, Kanaan is fortunate to be paired up with technical director and race engineer Eric Cowden. The experienced duo will make transitioning to the new kit that much easier and could make Kanaan a threat to contend for race wins early in 2018. Over the past weekend (December 9-10), 17 drivers competed for one $200,000 scholarship to compete in the 2018 USF2000 championship. Ireland’s Keith Donegan would be the man to walk away with the lofty prize, though he was far from a unanimous choice for victory leading into the event. 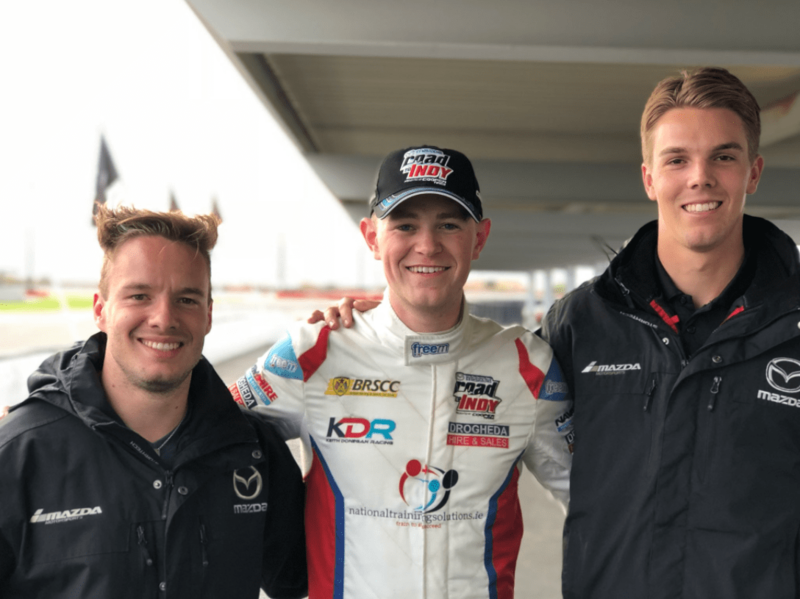 MRTI Shootout winner Keith Donegan is joined by Pro Mazda champion Victor Franzoni and USF2000 champion Oliver Askew. Forming one of the more unique stories out of the group of competitors, Donegan is an unusual case. With wins at Silverstone and other noted circuits in Europe, the Irish driver was a fine prospect as a teenager. In the midst of budding success, he decided to take a three-year hiatus from motorsport to focus on his academic studies. Noting a decreasing opportunity for advancement and a joint decision with family, the choice was simple to make for the young talent. Fast forward to April 2017, and the young Irishman has built a Formula Ford car with his father to resume driving. By finishing runner-up in the historic Formula Ford Festival, he was invited to participate in this year’s Mazda Road to Indy Shootout. You can read more about Keith’s fascinating journey here. Among the many new features in the 2018 IndyCar is an upgraded steering wheel dash display, courtesy of Cosworth. The manufacturer added an LCD digital display as part of the new steering wheel and electronic components to be introduced in 2018. 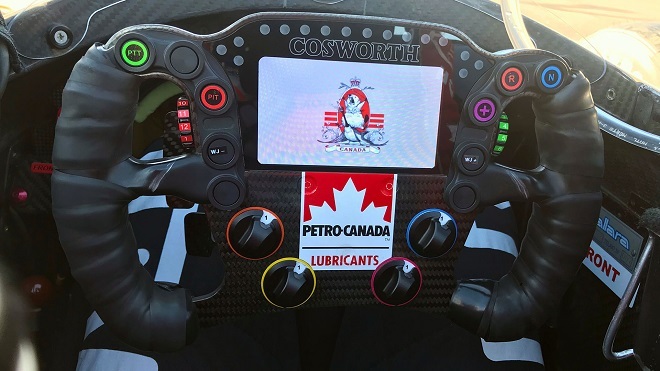 An image showing James Hinchcliffe’s new Cosworth electronics on an advanced IndyCar steering wheel. Hinchcliffe, who did add the caveat that teams will not know how to handle so many new options, also added that the on-board cameras will also be a lot easier for fans to read during the race broadcasts. The one thing the new dashboard does lack, per Hinchcliffe, is a brightness level that the old dash provided. In-car cameras have long been a unique aspect of the television viewing experience for IndyCar fans. The recent uptick in popularity of helmet and visor shots combined with the new digital dash should make the 2018 on-boards even more of a treat for viewers. On January 1, season 22nd season of ABC’s “The Bachelor” will premiere with a name familiar to IndyCar fans. This season’s bachelor is none other than former IndyCar driver and son of Indianapolis 500 winner, Arie Luyendyk Jr. The second driver in the Luyendyk family, an IndyCar participant last in 2006, was runner-up on season eight of The Bachelorette in 2012. The season preview also featured his father, two-time Indianapolis 500 winner and current IndyCar chief steward Arie Luyendyk. Parts of the preview show were shot during the 2017 series finale at Sonoma Raceway in California. IndyCar fans will have some reality television to look forward to as both The Bachelor and CBS’ Amazing Race (featuring IndyCar stars Conor Daly and Alexander Rossi) will both premiere in January.